A 12-year-old learner at the Etanga Primary School in the far north west of Namibia allegedly killed another little boy, only ten years old at the time of his death, during a fight over a bottle of water while both were at school. Joshua Tom, the principal of the school confirmed the incident and said that the 12-year-old boy had an argument over a bottle of water. The boys got involved in physical fight and the bigger boy hit the younger one with a tree branch on the chest. He said 10-year-old child fell down after he was hit and died on the spot. Tom said the school building is about sixty meters from the Etanga Clinic. He said a nurse from the medical facility was called to the scene and although she rushed she was unable to resuscitate the young victim. He was declared dead on the scene. The commander of the Namibian Police in the Kunene Region, Commissioner James Nderura, also confirmed the tragedy and said the 12-year-old boy was not taken into custody but has been taken to spend time with a social worker for counseling. Principal Tom noted that this type of incident has never happened before at his school. 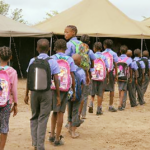 Etanga Primary School is situated about a 100 kilimeters west of Opuwo in Kunene Region and it has 230 learners from Grades 1 to 7.